The 2017 Toyota Prius is already redefining the concept of “Hybrid”, with its bold, sporty exterior, advanced yet welcoming interior, and engaging, fun-to-drive performance. Now, the Automobile Journalists Association of Canada (AJAC) has given Canadians another reason to take pride in driving the most popular and proven hybrid on the planet – naming the 2017 Toyota Prius the Canadian Green Car of the Year. The 2017 Toyota Prius is one of the first models built using the Toyota New Global Architecture (TNGA). This integrated approach to vehicle development enhances dynamic driving performance and safety and influences every aspect of vehicle design – including environmental performance. TNGA gives the 2017 Prius a sleek design that enhances its aerodynamic styling and low-slung silhouette. This, coupled to a hybrid power train and other technologies, boosts fuel efficiency and helps minimize emissions. The Toyota Hybrid Synergy Drive is built around a 1.8L four-cylinder Atkinson Cycle engine, continuously variable transmission, powerful electric motor, newly designed power storage batteries and powertrain management systems. The result is 121 net system horsepower and an impressive fuel efficiency of just 4.5L / 100 km city/highway combined – making this is the most efficient Prius to date. In addition to impressive performance, every 2017 Prius offers generous comfort, convenience, technology and safety features as standard. 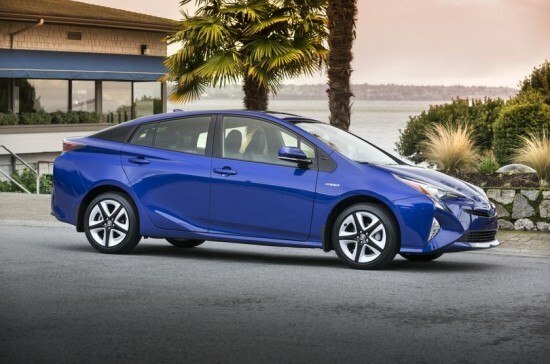 These include many features unique to hybrids – from the added power and efficiency of regenerative braking to four driver-selectable powertrain options (Normal, Power and ECO, plus Electric Vehicle mode for short distances) that tailor the Prius to suit any driving style and road or weather condition. Additional features include an ECO drive monitor, six-speaker Display Audio system with Bluetooth® capability, the Smart Key System with Push Button Start, an advanced full-colour gauge cluster, and more. Equally impressive safety systems include Toyota Safety Sense P – a bundle of advanced safety systems including Pre-Collisions System with Pedestrian Detection function, featuring forward collision warning and automatic emergency braking… Lane Departure Alert with Steering Assist function… Automatic High Beams… and full speed Dynamic Radar Cruise Control. Other features include the six active technologies of the Toyota Star Safety System, eight standard airbags, LED headlamps and daytime running lights, a backup camera, vehicle proximity notification system, and more.